If replacing oil seals and bearings on series I-IV Alpine's order bearings which are dust sealed, this will prevent most of the oil coming in contact with the seal when cornering hard. Note! New bearing left, the old bearing has holes between the ball bearings. If removing both half shafts it is worth removing the differential unit and checking the crown wheel bolts (setscrews) as they work loose and can fail, also don't forget to check that the breather on the top of the axle is clear. 1. 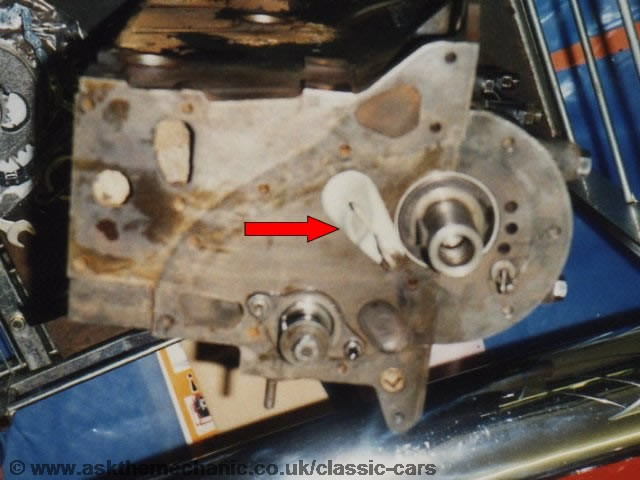 The face of the timing cover has small indentations to stop the gasket moving and oil passing, with modern silicon sealant this is now not a problem. 2. A deeper scroll in the pulley may be possible to have it machined deeper. 3. 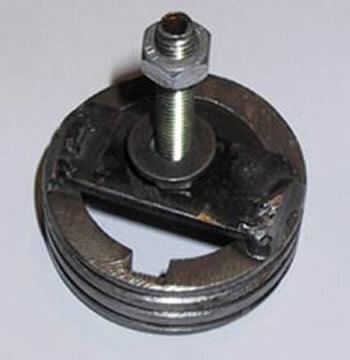 A much larger oil thrower (see picture) which covers the timing cover ring and stops the oil getting near the pulley, this I believe is the easier modification to carry out and the most effective. It will fit 1600 & 1725. I also made a timing cover centraliser (R.G.89 a Rootes tool, if you can find one) out of an old crankshaft pulley I had, cutting off the pulley part, welding a bracket across the pulley end to aid removal (see picture) and wrapping insulating tape around to make a tight fit in the timing cover, it is very important to centralise the cover around the crankshaft. I have seen weld marks where the cover and pulley have come in contact due to bad centralisation, this also makes a large gap on one side, bad for oil leaks. I would also always use a engine silicon and not a bath/window sealer I like to use a Vauxhall silicon part number 90485251 as it is black in colour (engine colour), easy to obtain in most large towns and is inexpensive at approximately £5, which will seal a complete engine. It is also important not to use too much sealer as it can squeeze into the engine sump breaking off with time and blocking the oil strainer in extreme use. It is important to make sure that engine breathers are clear and the engine does not have excessively worn pistons/bores, as back pressure will blow the oil pass the scrolls/seals. Note! This was made from a late engine you can see the deeper scroll.